VIERO - Nuova Pianta Iconografica.. Venezia. VIERO, T. - Nuova Pianta Iconografica.. Venezia. Nuova Pianta Iconografica.. Venezia. - VIERO, T.
Title : Nuova Pianta Iconografica.. Venezia..
Map maker : VIERO, T.. 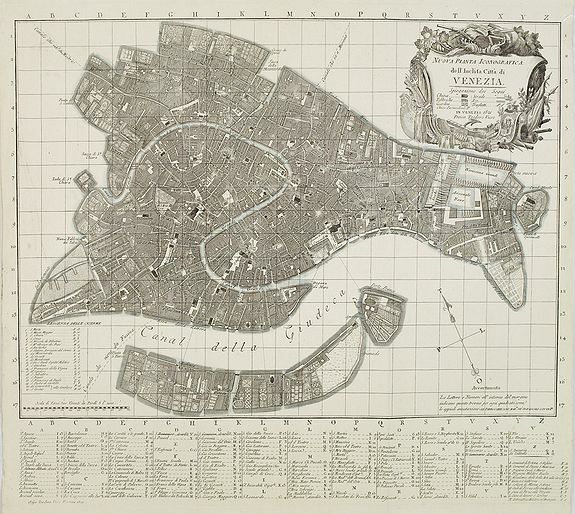 Description :Precise bird's-eye town-plan of Venice, clearly depicting the city's architectural landmark, being a reduction of Ughi's 8-sheet map of 1725. There is a grid engraved over the plan, referred to by the extensive key engraved at bottom listing palaces, churches, offices, etc. Decorative title cartouche. Theodor Viero was a map seller active in Venice and Merceria. Condition : A good and dark impression. Printed on heavy paper. Some light blue outline colour. With some old foldings.